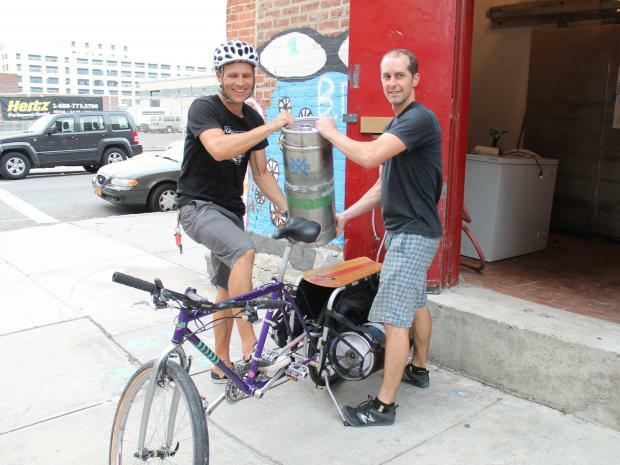 LONG ISLAND CITY — Hipsters don't need to ride the Rockabus to enjoy suds from Queens' newest brewery. Rockaway Brewing Company — a microbrewery which opened in June in Hunters Point, and until now sold its beers only at a seaside bar in Rockaway Beach — is now hawking its suds in Williamsburg and East Village bars. And in a twist befitting the skinny-jeans crowd, the first kegs were delivered to to Jimmy’s No. 43 at 43 E. Seventh St. in the East Village and Mugs Alehouse at 125 Bedford Ave. in Williamsburg Friday night on a custom-made beer bike, built by Recycle-A-Bicycle. The ride has a special frame built around its rear wheel with two pockets to hold kegs. “If people like it, they’ll order more,” said brewery owner Marcus Burnett, 40, who is also an Emmy-nominated cinematographer for National Geographic. Until recently, the Rockaway Brewing Company beer has been available only at Low Tide Bar at 96th Street and the Boardwalk on Rockaway Beach. The brewery, located in an old meatpacking plant on Fifth Street and 46th Avenue in Hunters Point, will also soon have a growler room where the owners are planning to start selling their beers “to go” sometime in September. This week they will start brewing a third variety: a Kölsch-style beer, which is a “very light ale from Cologne,” Burnett said. The owners want to make it as local as possible and have recently started growing hops in their backyards in Rockaway and at the brewery, hoping to use them for their beer sometime next year. As of now, the microbrewery produces about seven to eight kegs a week. Burnett and his business partner, Ethan Long, 40, whose other firm, Konduit, builds sets for films and music videos, said they have always loved suds. But they decided to open their own microbrewery a couple of years ago during a cross-country trip from California to New York, when they realized that many small towns around the country have numerous breweries while New York City has only a few.